A Fox Cities partnership that has grown steadily stronger for 15 years will be honored Tuesday, Oct. 22 by Lawrence University during the college’s fifth annual Report to the Community. Lawrence President Mark Burstein will present the annual Lawrence University Collaboration in Action Award to the Boys & Girls Club of the Fox Cities in ceremonies that begin at 8 a.m. in the Warch Campus Center. Brian Pertl, dean of the Lawrence conservatory of music, will serve as the event’s emcee and Ron Dunlap, retired administrator for the Appleton Area School District and current CESA 6 state coordinator of CREATE Wisconsin, will share thoughts on the state of education in the Fox Valley as the program’s keynote speaker. Lawrence’s Collaboration in Action Award recognizes an individual or organization, who, in partnership with Lawrence, has provided exemplary service to the Fox Cities community through strategic vision, leadership influence, long-standing commitment and enthusiasm, financial contributions and/or volunteerism. Since opening in 1998, the Boys & Girls Clubs of the Fox Valley has established itself as a leader and advocate for youth development throughout the Fox Cities. Lawrence, with its own mission of developing young people into responsible, engaged citizens, has long sought ways to complement and enhance the efforts of the Boys & Girls Club. The mutually beneficial relationship has enriched youth programming at the Club, while providing Lawrence students with valuable leadership and experiential learning opportunities. 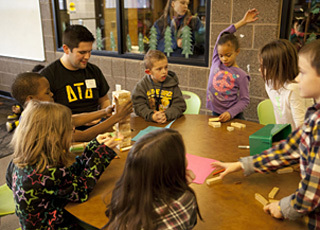 During the 2012-13 academic year, 173 Lawrence volunteers, interns and students were involved in community-based learning activities at the Club. The Lawrence partnership with the Boys & Girls Club reached a new level four years ago with a concerted focus on increasing enrichment activities for K-12 youth. With support from the Midwest Campus Compact Citizen-Scholar AmeriCorps Program, Lawrence placed a student volunteer coordinator at the Boys & Girls Club, which helped increase the number of students engaged in a diverse range of programming. The Self Agency in Youth (SAY) initiative, launched in 2012, provides tutoring and mentoring through two support groups — Hmong Youth Pride and Empowerment (HYPE) and Beautiful You African American Girls Group — for the Clubs’ ethnically diverse teenagers. Approximately 20 Lawrence students volunteer each week with the SAY program, which offers minority teens a sanctuary for self-expression and open discussions of their futures without fear of being judged by their ethnicity or background. Beautiful You African American Girls’ Group provides African American teen girls a supportive environment for discussing self-respect, self-confidence and race, while also learning about resume writing and college visits. HYPE offers Hmong youth a similar support network. Jerry Overstreet, The CLUB Teen Center coordinator, called the Lawrence student volunteers “a tremendous addition to all of our current The CLUB Teen Center programs and mentoring relationships. “Our relationship with Lawrence has provided low-income and at-risk youth with socialization skills, academic guidance and positive role models that we hope can help them ‘break the cycle,'” said Overstreet. Previous winners of Lawrence’s Collaboration in Action Award include the Mielke Family Foundation (2010), YMCA of the Fox Cities (2011) and the Appleton Area School District (2012).